Utilizing Cool Style sculpting technology to bring out the coolest possible scenes, the Extra Battle series incorporates amazing translucent effect parts for high-impact displays. 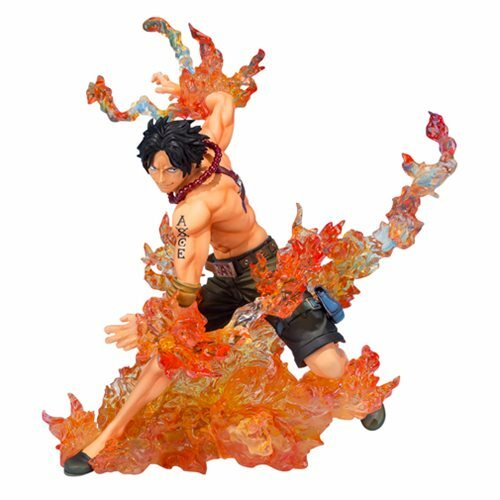 Here, the fixed-pose Portgas D. Ace is presented wreathed in translucent flame and is designed to be displayed together with the Monkey D. Luffy fixed-pose figure (sold separately). This 5 7/10-inch tall One Piece Portgas D. Ace Brother's Bond Figuarts ZERO Statue includes a stand. Ages 15 and up.